HoboNickels are a cryptographic currency, similar to Bitcoin, that are designed to make online transactions easy and efficient. HoboNickel wallet clients are being actively developed and improved upon. 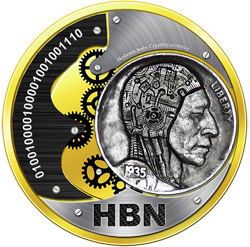 HoboNickels (HBN) is an extremely fast and efficient crypto-currency. With a Proof of Work block time of 30 seconds coupled with fast Proof of Stake, it is pushing as the fastest coin out there. The 2-5% Proof of Stake is also one of the most generous staking algorithm released . The stake is designed to keep the inflation rate from getting out of control, with the % of stake decreasing as more people stake the coin. HoboNickels has the added security of a Proof of Stake coin with the addition of security features like Automated Block Checkpoints. HoboNickels are the first coin to use Multi-Wallet functionality. SUPER STAKE: &nbsp;2% stake every 10 days! (100%) in a year holding your Nickels in your wallet.